I had such high hopes for Michael Sims book, The Story of Charlotte’s Web: E.B. White’s Eccentric Life in Nature and the Birth of an American Classic, when I recommended that our library purchase it. Unfortunately, I was very disappointed in it. After reading about a third of the book, I returned it to the library without finishing it. The reason I gave up on this book, is that I found it filled with extraneous information which hit me like filler in a hamburger. While it may be interesting that the Pledge of Allegiance came to being during E.B. White’s youth, it did not lend much to my knowledge of him and his work. If any of my readers have read this book all the way through, I’d love to hear your opinion. I never like leaving a book midway, but in this case, I felt I had no choice. The reading of it felt like work to me and too much of the story conjectured. This entry was posted in Uncategorized and tagged Books, Charlotte's Web, E.B. 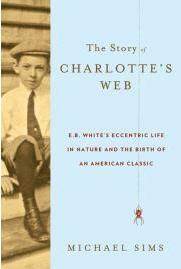 White, The Story of Charlotte's Web: E.B. White's Eccentric Life in Nature and the Birth of an American Classic. Bookmark the permalink.